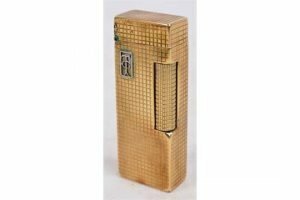 A Dunhill 9ct gold encased lighter with applied white metal initials “TG” in rectangular cartouche, no.1857352, marked to base. 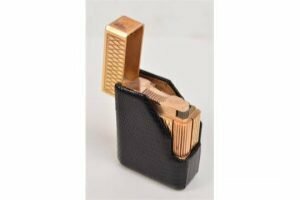 A Dupont gold plated lighter with pressed fish scale decoration, vacant cartouche, with simulated snakeskin cover and in presentation case. 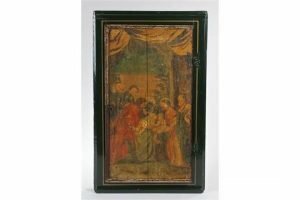 A 19th Century painted corner cabinet, the door painted with the three wise men looking at the baby Jesus, with a later green painted frame. 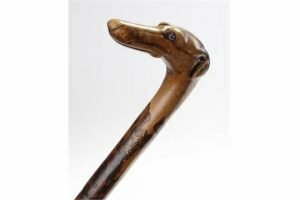 A 19th Century dog head cane, carved in a single piece of wood, the dog head with long snout and glass eyes. 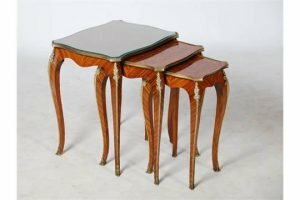 A nest of three French Louis XV style kingwood, parquetry and ormolu mounted occasional tables, the shaped rectangular tops raised on slender cabriole supports with foliate cast mounts and pierced sabots. 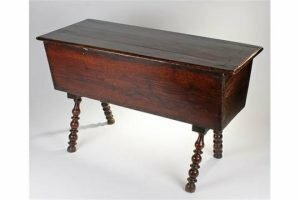 An 18th Century oak dough bin, the rectangular removable top enclosing storage space, angled planked body raised above bobbin turned legs. 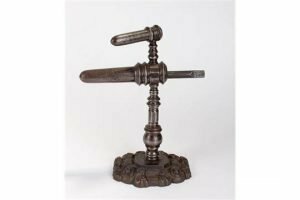 A Victorian cast iron and steel mounted double goffering iron, raised on a ring turned stem and a cast scroll base. 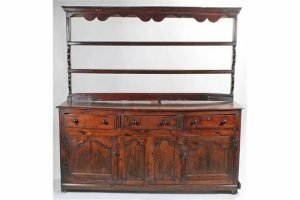 An 18th Century oak dresser and rack, the associated rack with two shelves, the base with a long rectangular top, three frieze drawers and two cupboard doors to the base either side of a middle panel. 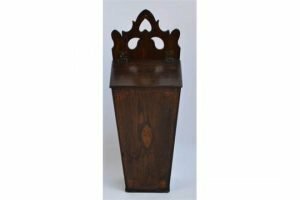 An early Victorian mahogany tea caddy of rectangular form with panelled hinged lid enclosing three lidded compartments, with ivory escutcheon. 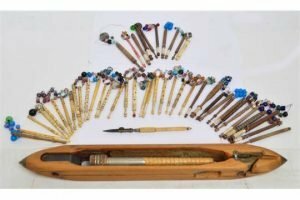 A collection of early 19th century lace making bobbins and thread carriers, mostly weighted by spangles of glass beads, made from hardwood or bone, some with names such as Dihannah Collins and Eliza, also a bone handled tweezer, a bone needle case, plus a wooden bobbin shuttle for a loom. 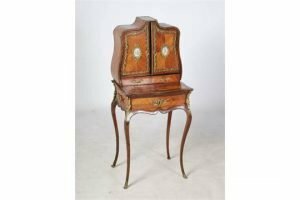 A 19th century French Louis XV style kingwood, ormolu and porcelain mounted bonheur-de-jour, the upper section with two cupboard doors each set with blue celeste ground porcelain panels painted with ladies, above a long drawer, on a serpentine fronted base with a single frieze drawer, raised on slender cabriole supports with scroll cast mounts and foliate cast sabots. 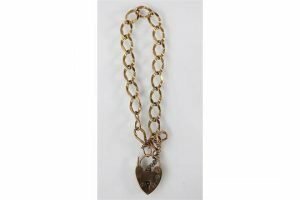 A 9ct yellow gold decorative link bracelet, the openwork faceted links with an attached padlock clasp and safety chain, weight 8.5gms. 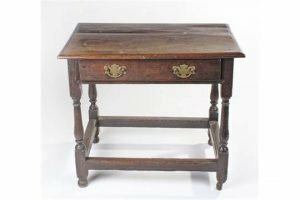 An 18th Century oak side table, the rectangular top with moulded edge above a single frieze drawer raised on turned legs, block supports and pad feet, untied by stretchers. 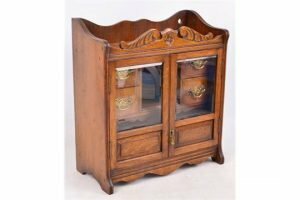 A 1920s oak smoker’s cabinet with pair of glazed doors enclosing glass pipe racks and fitted interior with four drawers, with floral carved gallery. 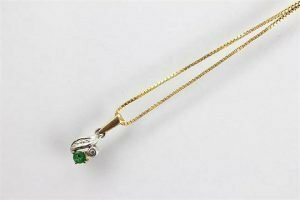 An emerald and diamond pendant and attached chain, designed as a foliate cluster, the fine box link chain stamped ‘375’, weight 2.3gms. 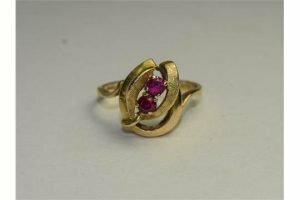 A 9ct yellow gold set ruby dress ring of flower head Design. Fully Hallmarked. 4 grams. 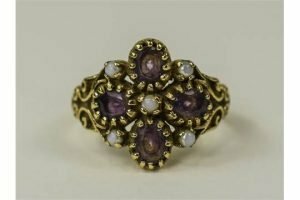 An Antique 9ct Gold Set Amethyst and Pearl Ring, with Filigree Shoulders. Fully Hallmarked. 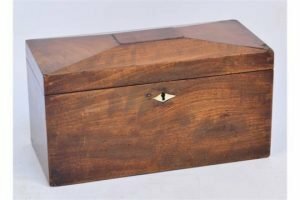 An early Georgian oak and inlaid salt box of rectangular tapering form, decorated with shell motifs, with pierced and shaped back. 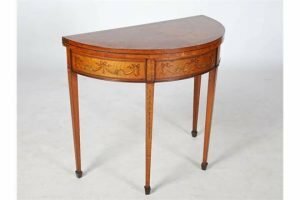 A 19th century satinwood and marquetry inlaid demi lune card table in the Neo Classical style, the hinged top inlaid with ribbon tied floral garlands and harebell pendants, opening to a green baize lined interior above a frieze with corresponding inlays, raised on four tapered square supports with spade feet. 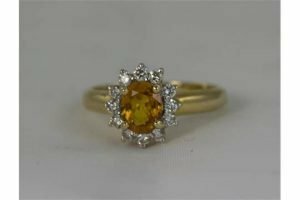 An 18ct Gold Set Diamond and Orange Sapphire Cluster Ring – Flower head Design. The Central Orange Sapphire Surrounded by 16 Small Diamonds of Excellent Colour, Marked 750.